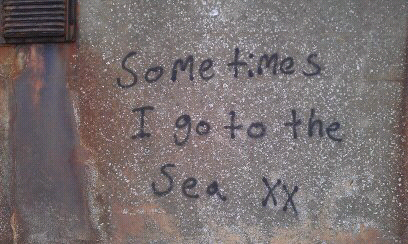 I found this graffito on the seaward side of a seawall at North Berwick today and found it strangely moving. I read it and thought: "Me too...". I grew up in East Lothian with a view of the sea, but I no longer live by the sea and miss it every day. So, this struck a loud chord today! Sometimes I go to the sea too... but not often enough! sometimes I feel I'm AT SEA! Hehe - maybe we should all go to the beach, if the weather ever improves!